Glydea WT hard wired curtain track: The simple form and sleek lines of our made to measure motorised curtain tracks compliment the most prestigious of projects, from high-end luxury homes and hotels to commercial conference venues and meeting centres. These superior curtain tracks offer whisper quiet day-to-day operation and the powerful mains powered Glydea 60e motor can drive track lengths up to 10 metres wide, whilst carrying a curtain weight of up to 60kg. With an innovative ultra slim rail design, this track is suited to all pencil pleat style curtains, whether you want centre opening curtains that will stack evenly at each end of the track or a side opening curtain running across. Your drapes will simply affix to the hooks that are conveniently positioned from end-to-end along the entire width of the track to allow the curtains to completely cover the track when closed and to subtly hide the motor at all times. 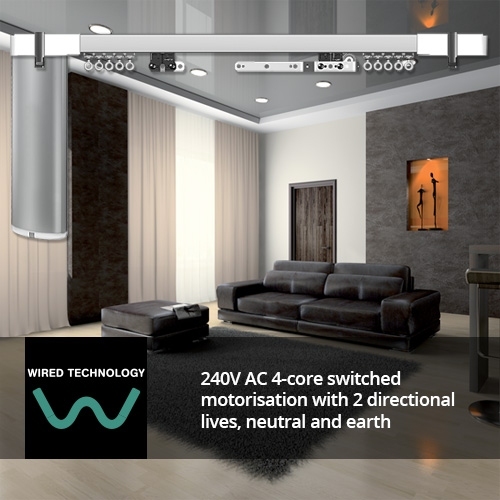 Controls: The Glydea WT curtain track is powered and controlled via the 4-core 240V AC supply cable exiting the motor. This offers an endless array of opportunities for control of your curtains as it allows you to integrate this motorised curtain track into a home automation or building management system. 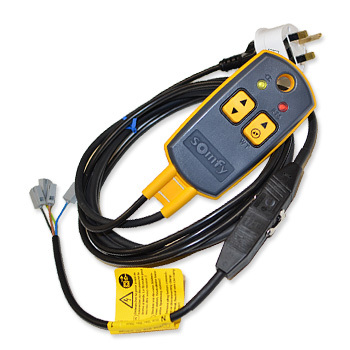 The 4-core cable would need to be wired directly to a 240V AC switched live control unit such as a blind or curtain controlling relay or a hard wired switch. By combining the splendour of the Glydea curtain track with the practicality of your chosen control system, you are open to a vast selection of control possibilities such as smart phone or tablet control, or even operation as part of a pre-determined 'mood setting' that could control your curtains and lighting simultaneously. Upon installation, the WT hard wired curtain track motor automatically determines where to set the points at which it needs to stop when the curtains are opened or closed, so the initial set up is quick and easy. The WT hard wired motor does not support the Touch Motion functionality - Touch Motion is only available with RTS or DCT controlled tracks. Ready to install electrically powered, made to measure curtain track with integrated 240V powered motorisation, for one-touch operation. Installation brackets suitable for either top fix or face fix installations, as requested. Comprehensive installation instructions are provided with each track.